The cat food world changes A LOT. When I have time, this list is updated. Meanwhile, you can help others by sharing info in the Comments. Scratching your head in the cat food aisle? I’ve been there. In fact, I’ve become a bit obsessive about how to choose the best cat food. I hope the hours of research and time I put into it will help you–and your cat. 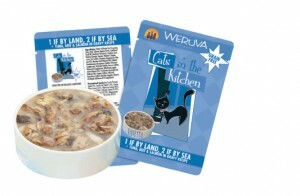 If you’re curious, I explain how I selected these cat foods here and answer FAQ’s about it here. To me, these issues are even more important than the quality and source of the micro-ingredients in a food and who manufactures the food. Of course, I would never use a cat food created in China, but high quality pet food canning plants are few and far between even in the US. Now, there are some small ingredients I’ve taken a great interest in – such as carrageenan and BPA. This is because there may be life-threatening problems associated with these substances if they are consumed regularly over time. On the other hand, people ask about a lot of ingredients, like guar gum, that are not – to my knowledge thus far – known to be a big risk. I think it’s easy, out of concern for your cat, to lose sight of the forest for the trees. So for me it’s about minimizing risk while keeping the higher priorities (above) in perspective and making sure we have enough good options to choose from. If your cat has special health issues, please be sure to consult with a good vet about their food. If your cat has an illness with weakened immunity, some vets recommend avoiding raw meat as a precaution against bacteria. Tip: On mobile, click the “+” signs for more info on each food. Most ingredients are organic or pasture-raised. nutrient-available form of cat food. VERY HIGH compared to others on this list. HOWEVER, this is because the recommend serving size is larger than the serving size recommend for other raw products. AND Rad Cat says some cats may not need as much as they recommend, depending on cat size and activity level. Uses water High Pressure Processing to prevent bad bacteria while preserving the enzymes that make raw food nutrients so available. TIP: You can get 4 for the price of 3 of any Rad Cat size at Pet food Express stores (at least in California). Saves a bundle! Meat ingredients are sourced from grass-fed farming with no hormones or antibiotics used. No BPA in can lining. No carrageenan (removed). Very low starch, grain free. Some ingredients are organic (not the meats though). Small company focused solely on quality pet food. Raw is considered most easily digested, nutrient-available form of cat food. LOW daily feeding cost compared to others on this list. Includes Montmorillonite Clay (from Azomite) that is tested as contaminant-free. While Primal contains more plant matter than I like to see in a cat food (making it more complicated for digestion), the fact that it’s raw outweights that issue and keeps it in the 1st tier. Manufactured in US at APHIS EU Certified plant. MED daily feeding cost compared to others on this list. LID formulas are best as they have more simple ingredients than other Nature’s Variety canned recipes. Readers have reported that Wild Calling uses the Evanger’s Illinois plant for canning their formulas. Personally, I don’t consider this a big risk, but some are uncomfortable with it. In 2010, Evangers was found by the FDA to be using dishonest practices in their own formulas. While this is appalling, it had nothing to do with their plant’s canning of other small brands. And, it has been corrected. In my opinion, this food has too many good features to overlook because they need to use one on of the few available US pet food canning plants (Evangers) to package their food. MED -HIGH daily feeding cost compared to others on this list. Moved from 2nd to 1st place because no longer contains starch ingredient. Beef is from Australia & New Zealand. Fish is from international waters, except for Tilapia, which is farmed in Thailand. Chicken raised in Thaliand. Manufactured in Thailand in human-food processing facility. Made inThailand at a human food factory. USDA certified chicken. MED (when extra shipping costs are added) daily feeding cost compared to others on this list. Raw is considered the most easily digested, nutrient-available form of cat food. Good news: Though formula includes potato starch, the carb percentage remains very low (under 5%). There is a misprint on some cans that indicates the product contains Vitamin D2. I have been contacted by the owner of Hound & Gatos, who assures me that it is a misprint; the product still contains D3, not D2. We assume the misprint will be corrected on future labels. Several plant ingredients, however these are all in powder form, making them simplier for cat digestion. Readers have reported a rumor (yet to be confirmed) that Holistic Select uses the Evanger’s Illinois plant for canning their formulas. Personally, I don’t consider this a big risk, but some are uncomfortable with it. In 2010, Evangers was found by the FDA to be using dishonest practices in their own formulas. While this is appalling, it had nothing to do with their plant’s canning of other small brands. And, it has been corrected. In my opinion, this food has too many good features to overlook because they need to use one on of the few available US pet food canning plants (Evangers) to package their food. Formulated to meet the nutritional levels established by the AAFCO. They also have a freeze-dried raw cat food that looks good. More convenient than raw frozen food. IMPORTANT: Add water as instructed – otherwise the carb count is too high, plus cats can get dehydrated & accidentally overeat if you don’t add water. All raw dehydrated food are in 2nd place because they require water to be healthy and some people may overlook this. 8% more moisture than most dry foods–more if you add water. Several experts say dry foods are too dehydrating for cats with kidney problems. Uses free-range chicken. Vitamin and mineral supplements are sourced from North America, Germany and France. Meats sourced from US, except Duck from Germany, Lamb from New Zealand/Australia. In 2nd place because contains some starch, making carb count slightly higher. Organic protein sources, oils, fruits, vegetables. In 2nd place because Feline Caviar uses the Evanger’s Illinois plant for canning their formulas. Personally, I don’t consider this a big risk, but some are uncomfortable with it. In 2010, Evangers was found by the FDA to be using dishonest practices in their own formulas. While this is appalling, it had nothing to do with their plant’s canning of other small brands. And, it has been corrected. In my opinion, this food has too many good features to overlook because they need to use one on of the few available US pet food canning plants (Evangers) to package their food. IMPORTANT: Stir in warm water (at about body temp); don’t have to wait to serve. Add water as instructed – otherwise the carb count is too high, plus cats can get dehydrated & accidentally overeat if you don’t add water. Only pet food legally allowed to call themselves “human grade” (they won a lawsuit). Company owned US plant is certified for organic and kosher products by the state of California. Meat is steamed at low temperatures to kill pathogens while conserving nutrient quality, then dehydrated. Introduce gradually. Texture is unique–some cats resist it. Ours like it better with ground turkey added. size is at their online store. All raw dehydrated are in 2nd place because they require added water to be healthy and many people may overlook this. IMPORTANT: Add water; rehydrate for 1 minute. Add water as instructed. cats can get dehydrated & accidentally overeat if you don’t. In 2nd place because contains large fish (4th ingredient), so should not be fed exclusively due to concerns about accumulated ocean pollution toxins and/or extra iodine affecting thyroid health over time. In 2nd place because contains large fish, so should not be fed exclusively due to concerns about accumulated ocean pollution toxins and/or extra iodine affecting thyroid health over time. In 2nd place because contains starchy ingredients, making carb count a bit higher than first place foods. Also because many formulas large fish, so those should not be fed exclusively due to concerns about accumulated ocean pollution toxins and/or extra iodine affecting thyroid health over time. Moved to 2nd place because Impulse now uses D2 instead of D3. While I’ve disqualified other foods because of they contain D2, I am revisiting this decision because we don’t have all the facts yet on D2 vs. D3. However, we know D2 is not utilized as easily, especially in cats, and there was a study that found mortality rate went slightly up in humans taking D2 and DOWN in humans taking D3 – see Mercola article. In 2nd place because Great Life uses the Evanger’s Illinois plant for canning their formulas. Personally, I don’t consider this a big risk, but some are uncomfortable with it. In 2010, Evangers was found by the FDA to be using dishonest practices in their own formulas. While this is appalling, it had nothing to do with their plant’s canning of other small brands. And, it has been corrected. In my opinion, this food has too many good features to overlook because they need to use one on of the few available US pet food canning plants (Evangers) to package their food. All raw dehydrated food are in 2nd place because they require water to be healthy and some people may overlook this. Also, this food contains a starchy ingredient (sweet potatoes), so carb percentage will be higher than the many foods on this list that don’t contain a significant starch. Meets (exceeds) minimum nutritional levels established by the AAFCO.com. No longer contains menadione (controversial synthetic vitamin K). MED-HIGH daily feeding cost compared to others on this list. Most cats love this food. I can only find it online–by the case. I suggesting getting their trial size first. You can save money & time with their auto-ship option. VERY HIGH daily feeding cost compared to others on this list. Instructions say feed 2 pouches for every 5 lbs of cat, so an active 10 lb cat would need 4 pouches per day – that’s a lot. CAUTION: The pouches not labeled Grain Free contain oat fiber, which is gluten-free in this case, but may not be the most digestible substance for cats. While all of these cat food choices are unbiased and based solely on what I would buy, I have started to allow some links on this page to be affiliate links in order to keep this blog funded. See How treatment-resistant feline IBS symptoms healed in one month and What to feed cats with feline IBS, diarrhea, or frequent hairballs. Many cat foods almost made this list. There were so many foods, I had to be brutal in selecting. 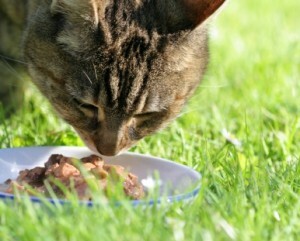 See These natural cat foods didn’t make the “best” list: here’s why (includes the Runner Ups!). Maybe I missed a food. Let me know if you have questions–I won’t always be able to answer every question personally, but I will add foods you ask about to my “To Be Researched” list. I also started a list best dry cat foods here–with some health caveats. Amazon.com and Petfooddirect.com carry many of these foods. Making your own raw cat food can cost even less than the packaged raw cat foods, and is one the healthiest things you can do for most cats. However, it is absolutely essential that you do it right, and add proper nutrients—serious health problems could result if you don’t add the right nutrients. Here’s the scoop! None of these foods are perfect, but they met my “best of” criteria. However, every cat has different needs, just like you and I do. I welcome your experiences, opinions, and contributions in the comments below. Can you please help to advise if Fussie Cat’s super premium canned wet food is good for my kitty? It is grain free and non-carrageenan. Many thanks! 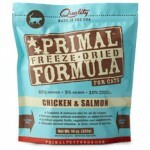 Does anyone else on here have cats that suddenly don’t like Primal freeze dried? I know cats are notoriously picky, but mine are young and healthy; and tho they liked some flavors more than others, they used to love some of them. Now, they hate all the flavors. Such is the world of Finicky Cats! Finicky, finicky. Like it one day/ hate it the next. I’ve been through it many a time. Run to buy a case of a new healthier food he seems to like only to have him refuse future cans of it. I have one cat that demands Fancy Feast or he will hunger strike! I’d suggest giving the Primal a rest and trying something new while feeding the standby food that he will eat. I find one of my cats highly changeable. If I take a food out of rotation for a while and introduce it back at a later date, he’ll often like it again. Currently, he is liking Whole Earth Farms canned Duck with Stella & Chewy’s Duck Duck Goose mixed in and sprinkled on top- with added water of course. Your kitty may eventually eat the Primal again and I hope he does! Good Luck! Hahahaha… yeah, you’re probably right. Just placed a huge order with Chewy for some new things to try. I just get soooo tired of researching cat food. Ugh. Pretty soon, I’m going to have to designate a room in my house for storage of food to hold out of rotation for a while. Luckily we have two feral cats that we feed…so the food I buy doesn’t go to waste. Ironic how they often eat better quality food than my spoiled indoor fur babies! Every once in a while I do some internet research on healthier canned cat foods and then I go to Petco or a local store to try them out before I commit to a case. If you can’t return what you buy on the internet, hopefully you can donate the food to cats in need. 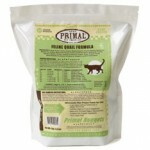 As an alternative to Primal, you might want to try Feline Natural freeze dried Chicken and Lamb. All three of my boys really like it. Is Jerilin the curator of the “Today’s Best Cat Foods” list above? I thought Liz was? What do y’all think about Health Extension brand? 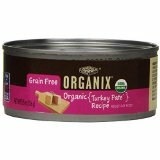 I’ve never heard of it before, but just found their Grain-free Real Turkey entree wet food on Chewy and the ingredients look pretty decent. Have you heard anything good/bad about this company in general? Like about their practices and reputation? I tried a case of Turkey Health Extension because my cats seemed to like it. The ingredients look good but I don’t know much about the company. I wish I knew more about them. Never see them on any lists. I’ve recently gone back to Wellness because I think the low carb ones are better than many other foods, it’s easy to get, and my cats will eat it! 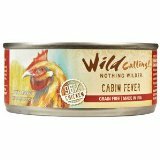 I mix canned with rehydrated freeze-dried raw and that seems to work for my cats (although I believe an all raw diet is healthier but I can’t manage it). Nature’s Variety LID canned cat food…the THIRD INGREDIENT IS PEA PROTEIN! Peas have lectins that even humans can’t digest so why CHEAPEN a cat food by SUBSTITUTING REAL MEAT with a VEGETABLE PROTEIN and NOT EVEN A HEALTHY ONE FOR CATS!!! I thought this was a good company until I read about pea protein. I’m phasing out the remaining cans and going strictly REAL MEAT like Tiki Cat and Miko by Chewy!! I wish I could find a legitimately healthy pate to supplement the REAL MEAT meals, but so far have not!!! WAKE UP CAT FOOD COMPANIES!!!!!!!!!!!!!!!!!!! I checked out Instinct LID and apparently, they’ve added pea protein to all of their wet foods – people are NOT happy about the switch. Our customers spoke and we listened. As of early February 2017, we have removed the menadione sodium bisulfite complex (aka. MSBC, a source of Vitamin K) and pea fiber in our dinners for cats. 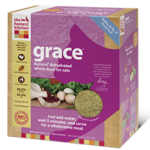 In our continued commitment to provide only the best nutrition to your feline friends, our fish-based products now contain dandelion greens (a rich source of vitamins and minerals) as well as fenugreek seed (another great source of vitamins and minerals). As always, the dinners for cats are still 98% meat, organ meat and bone with added probiotics, vitamins and minerals. Please be patient as these products work through the supply chain and as the information is added to our website. Please note that any bag with a best-by date of 2/2/18 or later will be affected by this positive change. Feel free to reach out to our customer service team if you have any questions. 1) Raw foods frozen in small kibble-sized chunks have too much surface area for freezer burn and bacteria to develop. Rad cat froze its foods in big lumps in sealed tubs… much better. 2) Most raw foods contain ground bone: not good for kidneys. 1) We think that Honest Kitchen’s “Grace” will be okay. However, one of our cats is reluctant to eat it, and she’s already underweight. 2) We can order deboned turkey from somewhere and mix our own (oh I so do not want to do that, such a mess in my nice clean vegan kitchen!). Do 2 things: dont feed dry and dont feed raw to a cat. My cats lived to be 22, 22, 20 and 18!!! Thanks. However, I’m hoping for a discussion focused on the specific problem of finding substitutes for Rad Cat for those of us whose experience has been that Rad Cat resolved problems that arose when feeding other foods, rather than a general discussion of the merits of feeding raw food. After 8 years of jumping through hoops trying to find great food for my two sibling cats, I finally gave up and now make my own. I do the research, tweak, found great supplements, and after just a few months my cats are friskier. The main reasons were : one day I accidentally touched a spoon to my mouth after it touched the expensive cat food I was serving them and I was grossed out. Then I thought, “Why am I feeding my cats something I wouldn’t touch?”. Plus… I know the initial meat quality – even for high end brands – is just not what I would give them. And the preservatives and other hidden chemicals. The way companies can switch ingredients without notice or source them from different places. My recipes are pretty easy, complete, tasty, and healthy. Each batch takes me about an hour and lasts about 14 days. The cats love it. Even buying premium ingredients and several supplements (enzymes, aminos, vitamins, minerals, ground flax seed, ect…) I figure I still save at least $500 a year. I feel better about what I feed them and could eat it myself if necessary. It’s not hard. I make a big batch (boneless and skinless chicken thighs, chicken livers and hearts, ground turkey….all good stuff) and split it into three large glass containers, freezing two and taking out as needed. I switch out some proteins each time, keep researching about vitamins and other things like amino acids, and am careful. I found I enjoy the process and feel I’m doing the best for my cats, two lovely creatures that have been so especially good to me all these years. Why not feed raw, ron??? Curious as to why you say that. Thanks. I’m hoping to keep this thread focused on the problem of identifying brands similar to Rad Cat *for individual cats (usually elderly) who don’t tolerate other foods well,* rather than a general discussion of what works for most cats most of the time. 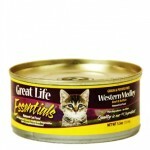 We’ve tried alternatives to Rad Cat before (it’s expensive), including quality canned foods. 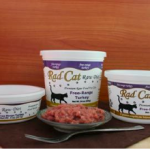 Every attempt brings back the health issues that lead us to try Rad Cat in the first place. 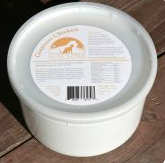 Contacted Stella & Chewy’s today to ask about the percentage of bone in ‘Duck Duck Goose freeze dried raw for cats.’ This is a food I feed and that all my cats like. I was told that the bone content in their diets range from 2%-10%…and that for proprietary formulation reasons, they could not release the exact content in each of their foods. I am not happy with this reply. Why can’t I know as a consumer what I am getting when I purchase their food for my cats?? What do you think? -Purina dry foods added and percentages adjusted after speaking with Purina Consumer Relations. -Pride Nature’s Variety Rockstar Rabbit was removed from the list due to the entire Pride line now being discontinued. Note: For most of the foods on the list only ONE recipe or formula is approved for both urinary and being higher protein, mod fat, lower carb and not the entire brand or range of flavors so please read the list carefully. Note: Farmina N & D large bags are available on Petflow, as is the Fromm pates. Only tiny Farmina bags are on Chewy. Note: the Nulo dry recipes on my list are NOT on Chewy. They are available from Petsmart in store or online only. All of the formulas on Chewy are NOT ok for urinary health. The only ones that are OK are the ones that say magnesium: 0.12% Max in the guaranteed analysis. -**Miko in consumme shredded foods (exclusive Chewy brand), all flavors. ***it giving them diarrhea..due to the excessive amount of gums in the food. Note that Weruva is coming out with new canned pate flavors very soon. *Note: Several other wet foods could be on the list for urinary but the low protein % is unacceptable and not worth your money not to mention that high protein is vital for a cat to thrive and have high levels of energy. 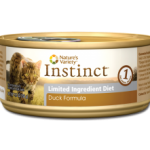 -Petsmart only–none of these formulas on Chewy:: Nulo Medal Series Turkey and Cod,Cod & Duck, Salmon & Lentils—regular formula not fit and trim/weight management (my cats didn’t like any of the Nulo choices.) (NOTE: the Nulo flavors I recommend are the ones that have Magnesium: 0.12% Max in the guaranteed analysis. Also don’t feed dry food with freeze dried raw in it such as Nature’s Variety with raw because of the BONE content…”no bone, no stone when it comes to cats urinary health”. Even if the magnesium isn’t sky high in these foods with bone all of the other suspect urinary minerals such as phosphorus and calcium also need to be checked. Excessive bone content is also heavily linked to constipation in cats. 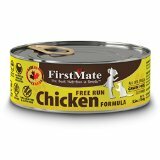 What about First Mate Pate Wet Canned food The Chicken and The Turkey flavor? Yes, I saw those but forgot to add them to my list. Thanks for reminding me 🙂 Yes if your kitties eat it those are great choices. I will add them to the list next time I update it. Larry, I just looked at First Mate a little closer. On first inspection seemed great, urinary friendly, etc. When I took a closer look though it is very high in carbs especially for a wet food. The dry matter carbs % for the chicken and turkey pate flavors is 23-25%. Potatoes or rice seem to be the second ingredient in most of their pates. The salmon and tuna 50/50 flavor pate seems to be lower in carbs then the other choices. Due to the high carb nature I am not adding them to my list. If you can find one that is lower in carbs besides the salmon/tuna flavor I will consider adding them-thanks bud. Hi, I read your food analyses with interest! I don’t know all the canned kinds you have evaluated. Have you looked at Dr Elsey’s Clean Protein, chicken, turkey, salmon pate? Or Solid Gold chicken and turkey pate? I have an IBS cat who is 16, no urinary kids so far but they are all older. Another is 13, then 11 then 4! Thanks for all your research. My cats have stopped dry long ago and since getting my first cat in the 80’s, food has drastically improved from that mess!! No junk commercial snacks but they do eat Cat-Man-Doo chicken and salmon! Check out their web site. Thanks again. I have 11 cats so I feed one dry meal to help with cost. If feeding dry Elsey is by far the best choice. The catmandoo snacks are just like pure bites freeze dried treats so great choice!! I don’t know what specific Solid Gold pate you mean but the tropical blendz aren’t on my list due to the high inclusion of coconut oil and it’s uncertainty at being safe for cats. 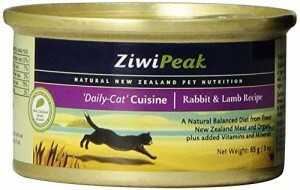 The Triple Layer products while nutritionally far superior all 11 of my cats hated. (and many other cats judging by reviews lol) so those aren’t on my list. The Dr. Elsey wet pate formulas aren’t on my list due to higher % of calories coming from fat then protein in all flavors and also the only one that makes my urinary cutoffs is the beef flavor. But, again, the beef flavor isn’t on the list because I require at least 38-39% of calories coming from Protein to make the list. If your cat eats the elsey pates that’s fine but just be aware that for your money–it’s a lot of money to spend for the nutrition it provides. Cats require high protein to function at a high level. (lots of playing..high energy) I hope that is helpful 🙂 Thanks for sharing about your adorable kitties. Thank you! So you are concentrating on high protein, less fat, wet or dry for optimum nutrition and to help avoid UTI events. My kids like pates mostly (Cats in the Kitchen 3oz turkey, chicken, duck, beef) but some love Weruva like Paw Licken. Also eat Merrick Ltd Ing. turkey, duck, chicken pate. Yeah, the Cat-Man-Doo kitty crack is a way better value than similar Halo. Youngest is a tortie that must have the chicken on her wet food! Tortitude! Based on my research, high carbohydrate foods are really bad for cats. And yet, the stores are lined with high-carb cat foods! Finding suitably low carb cat food is like finding ‘fragrance free’ kitty litter– it takes a lot of weeding through! Do you strive for under 10% carbs in foods you feed? I prefer under 5% but I will occasionally feed a food around 10%. Thanks. I think unless the cat is diabetic, under 15% carbs as fed is acceptable. In the dry category on my list a few of the foods are up to ~20% as fed. This is because of cost some may choose to feed a very affordable choice that is as close as they can afford to “appropriate” for cats, or to strech out a very expensive dry food, etc. A smaller amount of carbs can be actually beneficial to cats because the fiber can help very much with digestion and the fruits/vegetables carry a lot of vitamins and nutrients so that a less desirable man made vitamin doesn’t have to be used in it’s place. Peas and potatoes are used by a lot of cat food manufacturers in dry especially to balance out the ash and mineral content (of chicken and turkey, especially) to make it more urinary friendly. Sometimes they take it really overboard though. If too much is used it can make the ph wrong for cats. So if you use a dry with a lot of vegetable protein it’s better to mix it with one that mainly has animal protein. For an unscented cat litter I use Tidy Cats Free and Clean Unscented 35 lb cat litter pail on Chewy. I also like Fresh Step Simply Unscented and Dr. Elsey’s. Just a few updates to my cat food list with high protein, moderate fat, lower carbs that is safe for cats urinary tracts ie with controlled minerals…I am constantly trying new foods but if I missed something you think is great please let me know 🙂 Note that the fish flavors have been heavily vetted and approved for quality and mercury before being added to the list or the fish is very far down the ingredients list. 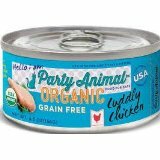 -Nature’s Variety Ultimate Protein Chicken dry removed as during testing my cats were constipated and one peed outside the box. This food was a little outside my mineral thresholds as you’ll recall. -Pride Nature’s Variety Rockstar Rabbit was removed due to the entire line now being discontinued. Note that I don’t recommend ANY Nature’s Variety due to mineral levels. -I am looking at new Chewy shredded food line Miko (sp?) closely. This food line may potentially soon be added to the list. *Note: NO Nature’s Variety wet food recommended any longer. The lowest option is 0.12% dry matter magnesium and the mon. Clay ingredient seems to bring urinary issues on extremely quickly and cause constipation. Well this is embarrassing. TMI poop talk warning. 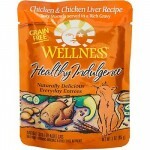 I am re-adding back the Nature’s Variety Ultimate Protein Chicken dry food because I mistaked a pee issue while trying the food out when it was caused by a poop issue. I give my oldest cat Meatball psyllium husk 2x a day for fiber because he usually needs it with his regular foods. The combination of the Nature’s Variety with the fiber seems to have been to much for the sweetie so he got super constipated and peed outside the box because of his constipation. He always pees outside the box if really constipated or really hungry lol. All is well now. If feeding this food even 1 time a day to your cat–he will not need fiber the NV food apparently has maybe a little too much fiber. (This is why we rotate or mix foods) So back on the list it and the canned rabbit goes too for now. I will keep testing them though. -Nature’s Variety Ultimate Protein Chicken dry re-added back to the list. -Pride Nature’s Variety Rockstar Rabbit was removed from the list due to the entire line now being discontinued. 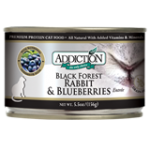 -Nature’s Variety Instinct Original Rabbit pate and LID Rabbit pate added to the list. Just a few updates to my cat food list with high protein, moderate fat, lower carbs that is safe for cats urinary tracts ie with controlled minerals…I am constantly trying new foods but if I missed something you think is great please let me know 🙂 Note that the fish flavors have been heavily vetted and approved for quality and mercury before being added to the list. 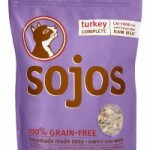 -Removed several Purina options due to carbohydrate %. ***it gives them diarrhea..due to the excessive amount of gums in the food. -Fromm Classic Pate Turkey & Duck flavor, other Fromm pates are ok too, check values on their website. -Nature’s Variety Ultimate Protein Chicken formula only (magnesium is 0.11% as fed and 0.125% dry matter, phosphorus is 1.3% as fed and 1.4% dry matter, ash is fine) so please mix with one of the foods above or below. 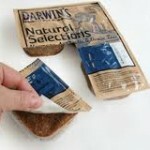 Darwin’s raw food has bone in it and seemingly as a result high mineral content so no I don’t recommend this food. Their nutritional analysis charts on their website are very very difficult to understand the numbers given and make no sense. You could email the manufacturer and ask for % magnesium and phosphorus on a dry matter basis to be certain (needs to be preferably at or under 0.11% dry matter magnesium and 1.35% dry matter phosphorus.) Your cat could very well be throwing up due to the bone content or an inability to chew the tough meat. If you must feed raw I would switch to a boneless raw such as Rad Cat or better feed the canned/pouch choices. The Weruva could also be bothering his stomach especially if you are feeding any of the Cats in the Kitchen line which I don’t recommend due to the high amount of gums and jello texture. The pouches from cats in the kitchen like Love Me Tender are all unnecessarily high in gravy and carbs. I recommend if needing to stick with Weruva the new pates especially the Lamb and Mackerel and the Name Dat Tuna flavor. You could try a chicken flavor but my cats didn’t like any of those. They are releasing new flavors in cans soon as well I hear. Yes, you should always add some water (~1-2 tsp) to your cats wet meals and always feed a wet “snack” (1-2 tbsp wet cat food with water added) with your dry meal if feeding dry as a middle meal while gone during the day or overnight. If you cannot be there to give this to your cat (gone during the middle of the day) you can leave the wet snack right before you leave and use a electronic feeder to dispense the dry. You can also freeze the little wet snack so it has to thaw and the cats can’t eat it right away hehe. I don’t believe in yearly Rabies shots either. If needed I would try to find a vet that doesn’t require you to get one or at least allows the 3 year shot instead which I feel is much more appropriate. In case you don’t see my new post I’m going to make about my list Nature Variety Pride line was discontinued (the whole thing) so Rockstar Rabbit will be removed from my list. The replacement option is Nature’s Variety Instinct Original Rabbit flavor only. Speaking of the instinct nature’s Variety rabbit I would not feed the regular canned. It is loaded with veggies and fruits. I feed the limited ingredient one which our cats regard as the “Cat’s Meow”. It disappears really fast so I have to slow them down a bit. It isn’t perfect, having copper sulfate but no canned is perfect and right now not well enough to cook for them and they looked at RadCat raw with a very unhappy expression. I am trying to move them to raw really badly. However, the LI rabbit is one they highly approve of and I rotate some weruva (not thrilled) with NV LI turkey. Was feeding tiki chicken Liao Puka and stopped. Might go back to it for a change. 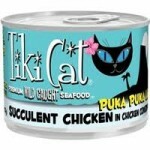 The Puka Puka from Tiki Cat is higher magnesium (0.14% dry matter) but my cats did love it when I fed it so it may be acceptable on a very intermittent basis only. I have not tried Rad Cat but I have heard very mixed reactions as far as cats liking it. 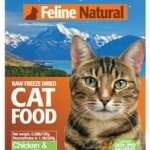 Feline Natural Raw Freeze Dried by K9	is great. I am giving this to my pets for a long time and they are really satisfied. 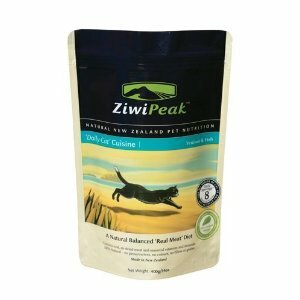 Can you name some brands of freeze dried raw that you think are better or worse as balanced formulas for felines? Thnx. Hi, What specific food are you feeding or looking at? It would be easier to just look at it that way.. Stella and Chewys has quite a bit of bone and I have seen constipation comments regarding the food. I believe the magnesium on it might actually be controlled (per a chewy response) but the phosphorus, calcium,etc is sky high due to the bone content. That one isn’t boneless and the company won’t say how much bone it contains so I personally wouldn’t feed the food knowing that information alone. 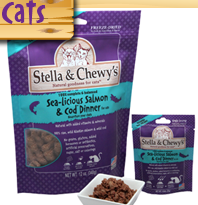 I feed my cats Stella & Chewy’s Duck Duck Goose and Primal Chicken & Salmon (along with canned foods). So these are the ones I am wondering about. I am open to trying other brands… Read that 10% is the cat standard, but around 7% is more natural for cats. There are brands and whole prey grinds known to be higher than 10%. For example, NV Instinct manages all raw for cat and dog to 15%, which is more than double the cat standard. Vital Essentials and Feline Natural raw are thought to be a little high, but are likely fine in rotation. One thing is for sure, there is no perfect commercial food… but am always looking to improve, though it comes down to what they are willing to eat. Yes a lot of it is what the cats actually want to eat lol. The Duck Duck Goose has quite a bit more fat than protein (percent of calories from). You should verify this with the manufacturer though because it can be hard to tell based on the guaranteed analysis. Just ask them for the M.E. (metabolic energy) profile for the food (percentage of calories coming from protein/fat/carb) and you can also ask them for the dry matter % magnesium and phosphorus. I like the phosphorus to be below or at 1.2% dry matter but up to 1.5% is acceptable on an intermittent basis. The magnesium % dry matter needs to be at or under 0.11%. The Chicken and Salmon Stella and Chewy’s seems to have the most protein based on the guaranteed analysis but again check with the manufacturer and ask for the metabolic profile. 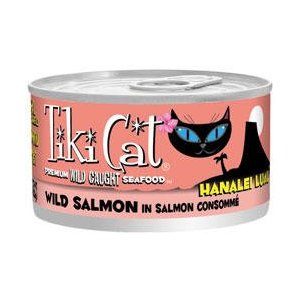 Yes no commercial food is perfect for cats so we do the best with what we are given..I’m pretty sure the Primal product is high everything so probably would significantly contribute to flutd but it’s been awhile since I’ve looked at the products. I agree that 4-7% bone is more appropriate for cats. A lot of manufacturers are using more than that unfortunately. – Weruva Mideast Feast, Weruva new pates (my cats hate the ones with chicken..I recommend salmon flavors and lamb and mackerel. Note that the lamb & mackerel one has high phosphorus for kidney cats), many other Weruva flavors are approved for urinary but my cats either don’t like it or ***it gives them diarrhea..due to the excessive amount of gums in the food. -Solid Gold Five Oceans Shredded tuna foods (all routinely screened for mercury) other Solid Gold wet foods could also potentially be great for urinary and nutrition..testing them out. *Note: no Nature’s Variety wet recommended due to excessively high magnesium and or phosphorus. 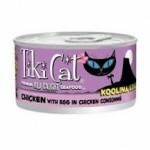 The same goes for Tiki Cat wet food-the lowest option starts at 0.13% DM magnesium. Rockstar Rabbit is ok for urinary but the protein % was maybe just lowered—looking into it. Several other wet foods could be on the list for urinary but the low protein % is unacceptable and not worth your money not to mention that high protein is vital for a cat to thrive and have high levels of energy. ***Just a note that I do NOT suggest feeding any freeze dried raw such as Stella and Chewy’s or Primal,raw food (besides Rad Cat perhaps as it is boneless) dry food with freeze dried raw in it such as Nature’s Variety,etc because of the BONE content…”no bone, no stone when it comes to cats urinary health”. Even if the magnesium isn’t sky high in these foods with bone all of the other suspect urinary minerals such as phosphorus and calcium also need to be checked. Excessive bone content is also heavily linked to constipation in cats. 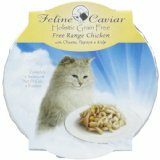 What about Halo Chicken Recipe Grain-Free canned Kitten food? 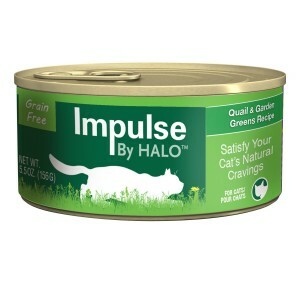 I also like Halo Impulse and Halo Spot’s Pate canned cat food. Low carb, grain free, and my cats like it. It otherwise seems like a good food though. If your cat enjoys it then you could rotate it with something higher protein just to make sure they are getting something daily that is high protein. Some of the halo recipes contain carragenan so be wary of that especially the regular line-the Spot’s Line. As far as urinary health for this recipe I have no idea-you would have to email the manufacturer I’m afraid. It does say ash 2% on Chewy so that’s good. Geo55, some Halo Impulse flavors are perfectly fine, the Rabbit flavor is high protein and should be fine on phosphorous but you would have to check on magnesium. I like that it doesnt contain carragenan. The Quail flavor is lower protein and much higher phosphorus then the Rabbit so might not be suitable for urinary health. You will have to check with the maker on these as I don’t feed Halo Impulse because I tried it and my cats hated it lol. I don’t see the rabbit flavor listed anymore on Chewy though so maybe that flavor is discontinued. The two flavors that are currently listed on Chewy based on the guaranteed analysis likely have quite a bit more fat then protein %. Feline’s Pride is now called My Pets Pride and apparently has been scamming people of their money and food since 2016. People were receiving rotten food with the change of owners, or not receiving product at all. I did a search on their yelp to see if they are still having problems and scamming people.. they are. I would consider removing them from this list. Our cats love Weruva however, my vet doesn’t love that it contains guar gum. SIGH… As far as the Tiki Puka Puka Luao is concerned, not only do they love it- it has no gum in it at all. The fluid content is great- and our cats lap it up. I just wish I could get them on raw. They just don’t have any interest in it. Our now two angel kitties loved raw and thrived on it. Double Sigh. I really can’t justify paying more for cat food than what I pay for prime filet mignon. I can buy fresh fish or beef for a lot less money. I don’t use commercial hamburger but I don’t have a problem paying $4.00 or less for meat and fish. It only takes a few seconds to finely dice enough for a couple of meals or I can do batches and freeze in serving size containers. $16. a pound for frozen cat food is ridiculous. Raw chicken is different from my perspective. That I want to cook first because of the bacteria risk. I have seen frozen rabbit on occasion in the stores but I haven’t purchased any yet. Why pay$12+ a pound to have someone grind up meat and package it. Do it yourself save $$$$ and then you know exactly what is in your cat’s food. I agree, plus you know the quality is tip top. I give my cats chicken thighs, hearts, cooked hamburger, raw beef cubes, turkey, occasionally lamb…. no pork and they’re sensitive to fish. I add a few crunchy biscuits that contain duck and flax seed, plus a multivitamin. I add chicken or bone broth to make a gravy, which they love. In rare cases I give them high quality carb free dry food when I’m in a super rush (and they regard this as a treat, lol), plus I have high quality, carb free wet food cans of duck or turkey, too. Once in awhile I sprinkle cat nip on top, which they go nuts for. I also occasionally add a little colloidial silver or slippery elm. They just turned 8 years old and so far zero health issues or need for dental cleanings. I think if I fed any dry kibble it would only be Acana or the like. I keep rad cat lamb around bc for whatever reason, it makes my cats cost look like a million bucks ( although I would never eat baby meat myself or meat other than fish for that matter). Hare Today Turkey chunks are amazing. He loves them. I love ordering from them but I’m gonna get away from all the grinds next go around and get into the whole prey thing. Gonna need a kiddy gate to keep him from taking it to the sofa though. Be aware, they run. I found your site in search of carb free cat foods. My primary search is for some dry. kibble that I can use as treats. We have two rescue cats that are 3 and 6 years old. The male is a large Bombay at 16 pounds the female is 10 pound tabby. We have had them for 7 months now. They both could lose a couple of pounds. They put the weight on eating some so called grain free high quality cat food that supplemented their wet food. They both really liked the dry food and of course put on the weight. We call it “kitty crack” now and have them almost entirely on both canned (convenient) and fresh meats and fish. I worry about giving them raw poultry. What carb free brand of dry food do you buy? How do you determine the quantity and frequency to feed your cats? What additional nutrients do I need to add to their wet food? I have a large breed Norwegian forest cat, the trick to know the quantity is cutting back if you see they are gaining weight as it means they are eating too much and don’t do free feeding rather stick with schedules feedings by giving them their food two or three times a day and then putting it away afterwards till next feeding time. My cat already knows his feeding schedule and will go to his mat when it time to eat. He eats a can a day in which is about 5.5 to 6.5 oz divided into three feedings, he has a healthy body fat mass and thick beautiful mane and fur. I don’t do fish except salmon oils, don’t do dry food or treats (they cause weight gain, health issues, and so on). Perhaps try doing more play time to up their activity to lose weight. High quality grain free raw and canned food generally cause cats to lose weight if they are gaining, cut back on quantity and again don’t give dry food if you can. My cat is a on a rotational meat diet in which he eats different type of meat (duck, guinea fowl, rabbit, lamb, venison, etc..) a day from different brands such as halo, bravo, ziwipeak, hounds and gatos, go! Lid, and sometimes nature variety or lotus’ just juicy lines and so on. ARCANA/ ACANA dry is the only dry food worth anything.. It depends as they under went some manufacturing and ingredient changes and not all are made in excellent quality such as those manufactured in the US vs Canada. Best to get from Canada if you can in which i heard is practically difficult as they rather just ship you the food manufactured from their US factory. The Champion Orijen or Acana has great reviews etc but it is still dry food, with 10 percent moisture or less and this caused my friends’ bengals to suffer health issues and so on even with three water fountains nearby. My cat suffered his first and last uti due to this dry diet and he normally drinks adequate amounts of water with two water bowls and two large water fountains nearby. After the all wet diet transition three years ago, he has zero health issues, no allergies, and thick coat and grown more inches as expected of his breed. If you think about it, dry food is still heavily processed and people report health issues are reversed or improved when switch to either raw or high quality canned food diet such as the person that wrote this blog as they are more species appropriate for feline diets. Now i understand for occasional convenience, some will feed dry but it shouldn’t be the mainstay daily intake food diet for them. Recently, my male friend was not convinced and felt his champion acana and Orijen was great for his Norwegian forest and just underwent two painful blocked mucus plugs with a high chance of reoccurrence. He had extreme difficulty switching to all wet diet as dry kibble is like crack even high quality premium ones, yet great determination was made and he finally got his cat to transition, no problems and allergies have disappeared since then. Acana/Orijen may seem good on paper and may be good for some but the formulas all have high magnesium, phosphorus, calcium and other minerals and you are almost guaranteed a urinary blockage on this diet. Plus when I tried it once years ago the crazy amount of rich fish and weird vegetables,etc,etc caused my cats diarrhea, constipation and to be just miserable in the potty. See my list above for dry (which should always be used as supplemental only to the wet, no more than 30% in a day) that has both controlled mineral values and is lower carb. It is extremely hard to find both. Pro Plan dry is vet recommended across whole of USA by “traditional” vets. Hollistic vets recommend Solid Gold Indigo Moon and Farmina N&D as better grain free options for urinary health. Dr. Elsey’s was formulated by a cat only veterinarian and is low minerals. In dry or wet the “meat” has to be cut with something to bring down the mineral values is the short answer. Better to be cut with proteins (Purina) then vegetables (ridiculously expensive canned/dry),imo. I always serve a cat broth pouch cut with water alongside leaving to go out of the house with any dry meal for guaranteed cat hydration. The cats LOVE the broth much more than a plain water bowl lol. Nature’s Variety Instinct, Merrick, Acana and many other grain free dry kibble are definitely not recommended due to risk of urinary blockage. I have tried every cat food brand out there at some point or other. Wishing everyone here the very best of health to any and all cats. You mentioned you give your cats several different brands, rotating them. I know you should be adding new foods gradually to avoid digestive issues. Does your cat do well changing brands regularly. My cats get bored with the same flavor, so I sometimes change types withinn the same brands, like just Weruva. My one cat will throw up occasionally, even if I give her a different flavor that she hasn’t eaten for a while. One thing I will mention is that Igive both of my cats Darwin’s raw for her evening meal and she has no problems digesting it and actually prefers the raw food over the canned. The other cat prefers canned, so I always give them the canned in the AM. But they both are fussy! They act like they’re starving in the morning, but then will walk away after I put the food down. I don’t like to leave wet food down for too long, especially in the summer. It’s like a food game they’re playing. My husband will comment that they’re on a food strike again. My brother and sister cats (just turned 8) were rescued at 8 weeks and I started them on a rotation diet with about half homemade. They’re basically not finicky so if they really don’t like something I don’t make them eat it, just change it. I can’t imagine what it must be like for a predator to rely on someone else where, when, and what they eat – 24/7!!! I try very hard to make them happy and healthy, and they reward me with kisses and tails up in the air. So far they are healthy and have great teeth and gums. I have done loads of research on pet food, feeding and pet health. For instance, a ‘finicky’ cat may be acting out not because of the type of food, but because she doesn’t like the bowl or where it’s placed on the floor. Or they may be bored and depressed. Exercise and ‘catification’ is crucial. Attention every day is mandatory. All pet owners should take time often to see things from their pet’s point of view. I feel so very sorry for the millions of pets that are forced to eat the exact same cheap food every day for years – a guaranteed way to shorten a life and end up with vet bills, as well as it being very unnatural to them. I don’t think the person who wrote the article replies here… I agree with you that the very expensive canned food is not worth it. If you are very concerned with ingredients probably easiest and cheapest to make your own. Make sure you are using a balanced recipe that has all the essential vitamins and nutrients and less than 10% bone. High bone content means high mineral content which means urinary blockage. When I made my own cat food for a period I used Alnutrin with calcium (for boneless recipes) and Alnutrin without the calcium supplement when making recipes with bone. As far as the kibble question..there is really NO carb free kibble. I will list the best low carb ones that I use (no more than 30% in a day). I have also made sure the magnesium and ash percentages are controlled (less than 0.10% dry matter magnesium) to prevent urinary issues. 1) Purina One Healthy Kitten Formula (only this Purina One-please use no other) by far best value for your money-not grain free. 20-22% carbs approx dry matter. Very high protein like most Purina. I feed to adult cats..”kitten” diet is just marketing ploy. 2) Purina Pro Plan Sensitive Skin and Stomach Lamb and Rice (approx 23% carbs dry matter) very high protein. I use basically all the dry pro plans besides weight management because of the higher minerals content and savor chicken and rice because of higher carbs. 8) new Weruva Pates occasionally, Weruva Truluxe steak frites. 10) Purina Pro Plan Chicken and Spinach Pate, Beef and Carrots Pate sometimes. Note: All these wet and dry foods are extremely high protein and also have controlled magnesium and ash for urinary health and my cats absolutely thrive on these foods. Have a good day. She occasionally responds as she is very busy. However there are great distinctions from low to high quality premium food as mentioned Purina and friskies although wet is still better than dry food, but not superior to others higher quality canned brands (Of course not all are superior or perfect) as what the main factor to take into account as not all protein is equal meaning there is a difference between plant and animal protein. Felines require higher content or all of animal protein, but many companies such as those listed above choose cheap low quality plant protein and other fillers to satisfy the percentages and keep the cost low, the ingredients are often questionable when considering the type of mineral and vitamin such a small vitamin k etc…used as well as type of meat or region), etc..
Jerilin, I do buy some of the top recommended foods from this list. But I recently saw this post by a vet on facebook which talks about the magnesium issue, which I fully understand. I see you mentioned that in your comment so maybe you can answer this. Do you know if the foods on this list are also fine in terms of magnesium content? I don’t exactly know how to be sure. Would it directly state “magnesium” in the ingredient list? I am particularly curious because one of my three cats has developed crystals in his urine (idk if they are struvite crystals or some other kind, or even if there ARE other kinds) and the vet had me put him on a prescription diet (Hills c/d) which is like way more expensive than the expensive things on this list. i’m wondering if the Hound & Gatos and Nature’s Instinct LID, which I’d been feeding him and which I still feed my other two, are also fine in terms of the magnesium/nutrient mixture, or if it’s possible that they are why he got crystals, and if so, maybe he could do fine on a cheaper diet than what I was giving him, instead of a more expensive one? Once upon a time, a long, long time ago, when Dr. T was but a lad freshly graduated from veterinary school, there was a disease in cats called F.U.S. – “Feline Urologic Syndrome.” Cats, especially those who preferred dry foods, would make nasty, razor blade-like crystals in their urine. These cats would strain to urinate, pee all over the place (particularly places where the owner would notice, like your bedspread or favorite chair), and pass blood in their urine. Male cats, neutered or otherwise, would obstruct and become completely unable to urinate. These cats could die in as little as 24 hours, and often required several days in the hospital with a catheter in their bladder before they could reliably regain the ability to pee by themselves. Then the Research Fairy discovered that the problem was NOT the ASH in the diet, but a complex interaction between the amount of MAGNESIUM in the food and the nutrient mixture that resulted in urine with a high pH (low acidity) and high concentration. The combination of these things resulted in the precipitation of little razor blade (struvite) crystals in the urine, which cut up the bladder lining, caused pain and bleeding, and could ultimately result in the formation of sandy plugs that made it impossible for the poor boy cats to pee. “HURRAY!” cried the happy cat owning villagers and veterinarians. “Hurray!” cried the makers of cat foods, who rushed to adjust their food recipes to eliminate the problem. “Meow!” cried the kitties who no longer were forced to pee bloody urine all over the place. When the foods were improved, FUS became (pretty much) a thing of the past. Veterinarians were forced to come up with a new name – “Feline Lower Urinary Tract Disease”, and later, “Feline Interstitial Cystitis” for the cats who continued to have similar problems even when the crystals were not present in their urine. And it looked like everyone would live happily ever after. BUT time passes, and the memories of men (but not women) are short. As the decades passed, new manufacturers of cat food came on the scene with new, and often very expensive kitty diets with catchy names. The wisdom of the past having been forgotten, these diets were no longer formulated in a way that prevented the formation of struvite crystals. And then, much to the despair of kitties and kitty lovers and veterinarians, the dreaded struvite crystals crept back into the urine of kitties, and some cats started to suffer – again – from a disease that had become all but a thing of the past. I would be glad to help you out. The magnesium % for cats is never usually listed on a can. You need to contact the manufacturer to find out that information. Ask them for the dry matter % magnesium. It needs to be at or less than 0.10-0.11%. I try to keep phosphorus at or below 1.2% dry matter if possible. If the manufacturer will only give you “as fed” values and not dry matter (more accurate) it needs to be at or below 0.25%. I don’t know specific numbers for either of the two brands you asked about but I do not feed Nature’s Variety because they are one of the worst offenders for both dry and wet for formulating cat foods with excessively high magnesium. 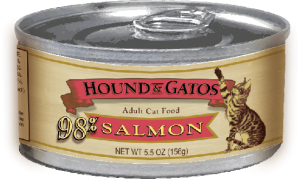 Also the Nature’s Variety and Hound and Gatos pates tend to have lower protein %. I like to see the % of calories from protein at least at 36%. Look for the chart at catinfo .org that says protein/fat/carb chart to see for the specific formula you are currently feeding. One new gripe I have with SOME of the Purina foods I previously mentioned as good is the amount of soy protein. Soy is a phytoestrogen and is said to be causing thyroid issues in cats. I don’t like to see it used as a protein in cat food. Pea Protein is ok but I don’t like to see it overshadow the meat protein or the cat tends to poop a lot and it contributes to the carb %. Cats are extremely picky but here is my current list of fed foods. Keep in mind there are other extremely well formulated foods that my cats just won’t eat. 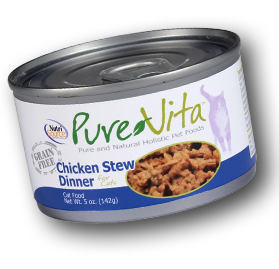 My cats don’t like Weruva shredded chicken foods because of the stringy tough texture of the chicken and many Weruva foods caused my cats diarrhea. The new Weruva pates have not though but some of my cats won’t accept their texture. Tiki Cat shredded foods are too high in magnesium!!! Ok here’s what I’m using…none of it is perfect but I am most concerned about cat nutrition, high protein and urinary health but do have some unacceptable ingredient concerns. I have 11 cats so I do feed one dry meal to help with cost but if you can wet is better (though try to avoid BPA as much as you can)…I feed fish but ask about mercury and look at the species of fish fed.. Wet: Purely Fancy Feast white meat chicken, chicken and beef, salmon and beef flavors, Muse Shredded Chicken and spinach cup, Muse shreddded chicken and anchovies pouch, **Nutro Max Cat Chunks in Sauce-all flavors, highly recommended (I do increase the protein by adding Crave or Wild Frontier chunks into it), Earthborn Hollistic Catalina Catch & Monterey Medley (chicken ones are high carb), Weruva Mideast Feast, Weruva new pates (my cats hate the ones with chicken..I recommend salmon flavors and lamb and mackerel), Purina Beyond Chicken, Beef & Carrot chunk in gravy, Taste of the Wild Rocky Mountain canned chunks in sauce (only a couple of my cats will eat this though), Solid Gold Five Oceans Shredded tuna foods (all routinely screened for mercury), Fancy Feast Classic pates (I try to feed the ones lowest in Phosphorus so beef and turkey), Purina One Turkey Pate, Sheba classic pate, Nutro chunky loaf pate, Nutro Senior soft loaf chicken, Crave (Nutro) chunks in gravy foods, Sheba Cuts in gravy (turkey flavor only), Lotus Just Juicy Shredded (extremely expensive), Naural Balance Catatoulli Stew (heard it was reformulated so buy at own risk), Merrick Backcountry chunks in gravy pouches (my cats hate Merrick pates and some of them have high magnesium or phosphorus), Fromm Classic Pate Turkey & Duck flavor. I used to feed some Weruva TruLuxe flavors but my cats have started rejecting them and I have noticed some looser stools. Treats: Pure Bites freeze dried one ingredient, other freeze dried one ingredient treats, Blue Buffalo semi moist high protein cat treats (Chicken and Duck, Chicken and Salmon, Chicken & Turkey, use the dry above as treat. Good morning fellow cat lovers. I visited Chewy this morning and searched for two of the wet foods we feed (we are trying SO hard to transition to raw), and while these are only three of the canned foods I searched, looking for magnesium content, since many of the cat foods sold on Chewy does have a nutritional list for most of the foods they carry, Weruva Cats in the Kitchen Fowl Ball has 0.03%, and Instinct Nature’s Variety Limited Ingredient doesn’t list magnesium on the nutritional contents. I checked Wellness Core chicken and turkey (we don’t feed this) and it too had 0.03% magnesium. We rarely feed any food that contains fish, since fish can be irritating to the bladder, and invite FLUTD- which dry food does also from what I have been learning. The other day I received an ad from Nom-Nom, so I checked their chicken formula and while the first ingredients is meat, there are also too many fruits and veggies in their formula. I wrote to Nom -Nom inquiring about the reason for so many plant proteins in their ingredients, they responded to me very quickly saying that their recipes are based on the recommendations by their veterinarian who states that this formula was created to mimic cats’ ideal prey since these items may be found in the prey’s digestive tract. The percentage of fruits and veggies is about 10%. The problem is that the prey animal consumed by a cat has the plant protein digested already. Lacking the enzyme to easily digest carbs, carbs are not an ideal species appropriate diet. 10% is a substantial amount, in my opinion.So, another disappointment. Thankfully one of our cats does like small test pieces of raw chicken and raw beef. Just wish our other cat so so inclined, still I am working on it. I would much rather grind our own and add the necessary supplements to make their diet both nutritionally complete and species appropriate. Just another update here on this thread regarding wet and dry foods that are safe for cats urinary tracts…just heard back from Mars re their new Wild Frontier Cuts in Gravy and Crave Cuts in Gravy that were previously on my approved list…unfortunately these new foods are very high above my magnesium threshold cutoff and unsafe for cats. There is one formulation which should be OK…the Wild Frontier Turkey and Duck Cuts in Gravy (yellow packaging) This food has as fed magnesium % of 0.11%. My cats aren’t seeming to like these new cuts in gravy nearly as much as the Max Cat Chunks anyway due to the minced texture…the much higher protein in the one approved Wild Frontier Cuts though is worth mixing it in with the better liked food… the pates from these new Mars food lines all have carrageenan so I don’t recommend and the dry food from these lines aren’t safe for urinary health. 2 new dry foods to add to the list are: Go! Sensitivity + Shine Freshwater Trout and Nulo Medal Series Salmon & Lentils and Nulo Medal Series Turkey & Cod. My cats didn’t like the Nulo flavors but your cats may like…haven’t tried the Go! one yet. – Weruva Mideast Feast, Weruva new pates (my cats hate the ones with chicken..I recommend salmon flavors and lamb and mackerel), many other Weruva flavors are approved for urinary but my cats either don’t like it or it gives them diarrhea..
*Note: no Nature’s Variety wet recommended due to excessively high magnesium and or phosphorus. The same goes for Tiki Cat wet food. Rockstar Rabbit is ok for urinary but the protein % was just lowered. Several other wet foods could be on the list for urinary but the low protein % is unacceptable. Treats: Pure Bites freeze dried one ingredient, other freeze dried one ingredient treats, use the dry above as treat. Found one additional dry option safe for urinary health while browsing Chewy since it won’t quit raining here!!! Also wanted to add that I’m still looking into the Rockstar Rabbit wet food protein lowering issue..food appears unchanged in numbers on Chewy but I received cans with a different guaranteed analysis and lower protein % that my cats don’t seem too want to eat. I would just like to add one additional comment regarding safe food for cats urinary tracts (and avoiding stones, crystals and utis) and that is that virtually almost all (**unless it is boneless AND actually balanced for cats) commercially available frozen or dehydrated raw cat food contains an exorbitant excessive amount of bone which means excessively high phosphorus and magnesium which is all but guaranteed to wreck havoc on your cats urinary and renal systems. “No bone…no stone” is the adage. In addition this excessive amount of bone almost always causes severe constipation and digestive distress in cats. Apart from Rad Cat raw and any other bone free (or LOW bone) frozen or dehydrated raw none of these diets are safe for cats…small amounts of bone ARE a good source of natural calcium for cats but the problem is since bone is much cheaper than muscle meat most of these “healthy” “spectacular for your cat” food companies are putting much more % bone content then necessary for your cat to get it’s daily calcium % and then refusing to tell you how much they are even putting in the foods at your cats health expense. With so many people feeding these high bone dehydrated raw recipes it’s no wonder the number of cats in the vet office in complete misery with blocked urinary tracts. Jerlin, I did not know about the effect of high bone/magnesium content of the freeze dried raw foods. I am going to research this and continue to feed this food only in moderation. Thank you for the heads up! If you are going to feed some dry food, imo the best out there is made by Young Again. It is low carb with a healthy nutritional profile. I feed my cats wet meals and give them a small amount of YA Mature Health dry food as snacks- usually less than a tablespoon at a time since a diet of low carb, grain free wet/ raw food is the only really healthy kind for a cat. I recommend calling Young Again and speaking to Jennifer who does a great job explaining why their food is so much better than the average corn-laden, crap-based dry food on the market. (800) 311-6646.
i discovered Riplee’s Ranch brand, Canadian made. Ordered it by post. It has no gums. Google and try it out if you like. It uses human grade meat. My cats actually will eat it. Worth a try for others looking for healthy, and fresh, as they make it in small batches, food. The Ontario rep let me pay for a sample box so I could try some first rather than starting with a whole case. and for human grade meat. The price….its the same around as pet store brands. 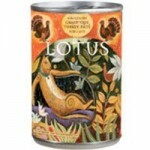 Lotus makes other food than the fish one. My kitties eat the Just Juicy Chicken and Just Juicy Turkey and love it. I also Used to get lotus just juicy lines as they contain no fish, but was so disappointed the last recent times as the pork and venison was so little in quantity and mostly liquid, especially factering price the past batches were more fulfilling. May i ask Is the turkey quantity more thicker- meaning more meat and not mainly juice or stew? I would post a pic of the pork but did on chewy reviews. I don’t believe allergy is usually for life, just take it out for awhile and add back later small amount. All the foods have some filler, so I rotate a lot of brands. and also few times per week the Weruva pate chicken and pumpkin. with constipation, and none of my cats seem to have allergy . Don’t think any of the brands don’t have fillers. There is occasional one that is supposed to be healthy but they won’t eat it, still through trial and error I have about 8 or more brands that they will eat, and just rotate everyday. I always open 2 or more cans so if one cat likes one type more and the other cat likes other brand more, then I am not throwing stuff away. Working out okay with the limited amount of brands available in Canada, which is annoying we are not allowed to buy from America our closest neighbour, pet food that is in a can. as U.S. has a lot more choices of pet food. My cats get a few kIBBLE a few times per week, I found this to actually help my cats stay regular, even though kibble has a bad rap, it has worked giving a small amount, better for my cats, then not giving any. he was constipated often when I previously tried completely moving kibble. Also keeps them happier like a treat..
Also an avid believer if cats can go outside monitored and walk on grass and they are trained by putting in significant time with them to not run away then of course they should be like a natural cat was intended to be. My cats have never run away, but I hang out with them, and had put my time in with training. Its been 7 years here now with them having a great life of some outside time. There has not been problems like some people think like cat fights or dying birds. I only mention this because cats have got a bad rap, whereas someone who never allowed a dog out of the house would be criticzed.